2 April 2015, at 12:00a.m. In a large herd with group housing and electronic sow feeding (ESF), there were significant benefits when younger sows (parities 1 and 2) were housed separately rather than mixing them with older sows, according to a report by Y.M. Seddon, F.C. Rioja-Lang and J.A. Brown in the Prairie Swine Centre Annual Report 2013-14. Electronic sow feeders (ESF) provide an automated system for controlling the individual feed intake of group-housed sows. However, this system can prompt increased aggression, especially in the initial period following mixing, as sows compete for access to the ESF. The primary objective of this research was to compare different methods for grouping sows and their effects on feeding behaviour, sow injury and production. Sows were housed in groups of mixed parity (control), or uniform groups of low (parities 1-2), medium (parities 3-4), and high parity (≥ parity 5). Of specific interest was whether low-parity sows experience less aggression and injury during gestation when managed in uniform groups than in mixed groups, and what effects these treatments may have on production measures. Preliminary results indicate there are some benefits to housing sows in uniform groups, especially for younger sows. Sows in uniform groups had reduced lameness, and younger sows were able to increase backfat over gestation, as opposed to losing it. Younger sows in mixed groups lost backfat, suggesting feeder competition was more of a challenge for these sows in the mixed parity group. No production differences were found among the different grouping methods. Managing gilts as a separate group is already a common practice, and the results from this study suggest that parity 1 and 2 sows can also benefit from this practice. Maintaining uniform groups also reduced mixing injuries, in uniform medium- and high-parity groups with injuries sustained following mixing being equal to or lower than in mixed parity groups. However, the low-parity uniform group had higher injury scores. Greater injuries in younger sows is more likely related to the social ability of these animals, and management of gilts to improve sociability is a further management consideration that could be implemented. The management of sows in groups generally requires greater input from stockpeople than management of sows in stalls. While group-housed sows may benefit from increased freedom of movement, these systems can also result in increased aggression and decreased welfare, particularly in lower-ranking animals. Electronic sow feeders (ESF) are a method for managing sows in group housing, providing an automated system for delivering and controlling individual feed portions to sows. Aggression often occurs when sows are initially mixed and establishing their dominance hierarchy but can also be ongoing throughout gestation due to competition for feed and lying areas. If managed correctly, ESF systems can significantly reduce ongoing competition for feed. However, if not managed correctly, sows in ESF systems can experience prolonged daily competition for access to the feeder throughout gestation. Low-ranking sows tend to have a disadvantage in ESF systems because they receive more aggression and injuries, have reduced production, gain access to the ESF later in the feeding cycle, and are displaced from feeding more often. In static groups, high-ranking sows eat earlier in the feeding cycle and for longer. Because the use of ESF systems is becoming more common in North America, information on how to manage low-ranking sows in these systems is needed, and will benefit sow welfare and productivity. The current study examined the effect of different grouping strategies (mixed parity groups and uniform parity groups) on the welfare and productivity of group housed sows in ESF, and to determine their effects on the feeding behaviour and injury scores. Determine whether low parity sows (parities 1 and 2) experience less aggression and injury during gestation when managed in uniform groups than in mixed groups, and what effects this may have on measures of production. Determine any effect of mixed and uniform grouping treatments on variation in sow ESF entry time (feeding time of day), both within individual sows and among sows within a treatment, and whether this influences productivity. This trial was conducted over six replicates with 240 sows per replicate, and 1,440 sows trialed in total. For each replicate, four groups, each of 60 sows were formed, comprising of low (parity 2), medium (parities 3 and 4) and high parity sows (parity ≥5), and one mixed parity group (Control, parities 2 to 8). Sows groups were first formed in a mixing pen, where sows were kept for one week. 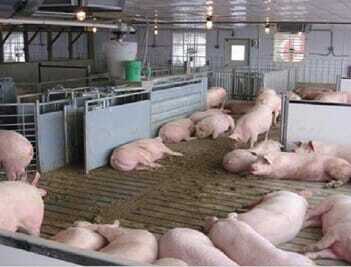 After one week, sows were moved to their final gestation pen where they remained up until farrowing. All mixing and gestation pens contained one ESF feeder (Nedap, Groenlo, Netherlands) with software to record feeding time (time of feeder entry) and feed consumption for individual sows. Feeding behaviour was recorded throughout gestation, up to the time that sows were moved to farrowing (approximately day 112). Body condition score (BCS) was determined for each sow before being mixed at five weeks gestation, at day 112 of gestation, and at weaning. The BCS was determined using a scale of 1 (very thin) to 5 (obese), (Young et al., 2004). Sow weight was recorded at five weeks gestation. Sow backfat thickness was measured on a sub-sample of 20 per cent of sows, equally distributed across parity and treatment. Standard production measures at farrowing were collected, as were piglet weights from a sub-sample (27 per cent) of litters. Sows were scored for skin lesions and gait prior to being mixed at five weeks gestation, at three days after initial mixing (gait and lesions), and at seven days after final grouping in the gestation pen. Lesion scores ranged from 0 (no injury) to 3 (severe injury) and were evaluated for 11 body regions, and gait was assessed using a standardised scale from 0 to 4. Sows with lameness score ≥2 were removed from the study and placed in relief pens and provided care based on the farm’s procedures. All sow removals due to lameness or other health considerations were recorded. Within all of the treatments, average meal length ranged from 15 to 20 minutes, with the longest daily feeding duration found in the uniform low parity group. There was no significant difference in average feeding duration among the treatments. The longest feeding duration recorded was performed by low-parity sow groups in the first two weeks of gestation, taking 20 minutes to feed. By the end of gestation, feeding duration for low-parity sows was significantly reduced, with average meal duration of 17 minutes (Table 1). The longer feeding times for young sows may reflect their lack of familiarity with the system, or greater time spent exploring the feeder. * Gestation period: Early: weeks 1 and 2, Mid: weeks 5 and 6, Late: weeks 9 and 10 following mixing. ** Within a row where letters differ, P<0.05. A significant positive correlation was found between the average daily sow feeder entry order and sow bodyweight, (r=0.13; P<0.01), and also between sow parity and average daily sow feeder entry order (r=0.07; P<0.01). This suggests that smaller sows were eating earlier in the feeding cycle. However, previous studies have found younger sows eat significantly later in the feeding cycle than old or intermediate sows. Between treatments, there were no differences in the total number of piglets born, the total number born alive or mummified piglets born but differences were found in the number of stillborn piglets, pre-weaning mortality up to five days of age and the number of piglets weaned (P<0.05). Uniform grouped high parity sows had fewer total piglets born, higher piglet mortality and fewer piglets weaned. This is likely due to differences in productivity due to sow age, rather than a result of the treatment. Ongoing analysis will examine differences in the number of sows removed per treatment over the course of gestation due to low BCS, injury and lameness. There were significant interactions between treatment and parity score on the change in backfat from five to 15 weeks gestation. High-parity sows were the only ones to gain backfat in the mixed group, while other sows in this treatment lost backfat over the course of gestation. Young sows (parity 2) lost 4.12mm of backfat on average when in mixed groups, while in the uniform treatment, these sows had an average gain of 0.22mm. Although parity 3 and 4 sows did not fare significantly better in uniform groups, these sows did show positive gains instead of loss when in uniform groups. This indicates high-parity sows could be dominating access to the ESF system, and reducing the ability of younger parity sows to feed at regular intervals, or preferred times of day in mixed groups. Sows in the mixed parity group had a significantly greater increase in lameness between the pre-mixing assessment and day 3 after mixing (P<0.01), and also during the period from pre-mixing to seven days after final grouping (P<0.05), compared to the uniform treatment groups. This indicates that there was a greater risk of lameness following mixing when sows were housed in mixed parity groups, and that housing sows in uniform groups helped to reduce the severity of lameness that developed as a result of mixing. Across all treatments, the total average body lesion score increased in severity from pre-mixing to five days post-mixing. After this time, a reduction in lesions was observed, indicating that the greatest amount of aggression occurs in the period immediately following mixing, and reduces thereafter. This data also suggests that there was little ongoing aggression or injury due to competition for ESF entry once the group hierarchy was established. The lesion score data suggest that injuries from aggression were largely related to sow age, with the uniform low-parity group having the highest injury scores. Medium- and mixed-parity groups had intermediate lesion scores, and groups of uniform high-parity sows had the lowest level of injuries on day 5 following mixing (P<0.001). The preliminary results from this study suggest that housing sows in uniform groups in ESF systems may be a positive strategy for the management of group housed sows. ESF is a feeding system of choice for managing large sow herds in groups. The large herd (6,000 or more sows) sizes found in North America will make it possible to consider grouping sows by parity in these systems. In this study, housing sows in uniform groups helped to reduce the severity of lameness developing as a result of mixing. The increases in backfat over gestation also suggest that the well-being of younger sows may be better in uniform groups, and that competition may be less in uniform groups. The practice of managing gilts separately is already a common practice, and the results of this study indicate that parity 1 and 2 sows may also benefit from this practice. While the productivity of sows in uniform groups was equivalent to that of mixed groups, the study followed sows through one gestation, and so there may be longer term effects on sow longevity. Maintaining uniform groups may help reduce mixing injury, with injuries sustained following mixing being equal to or lower in uniform groups than in mixed parity groups, with only the low parity uniform group having higher injury scores. The injuries found in low-parity sows appear to be related to the social ability of younger pigs rather than grouping, and thus management practices that improve sociability of gilts (e.g. increased socialisation by repeated mixing before breeding) may be a further area of research to be examined. Acknowledgements: The authors gratefully acknowledge specific project funding for this study provided by the National Pork Board. Strategic programme funding to the Prairie Swine Centre was provided by Sask Pork, Alberta Pork, Manitoba Pork Council, Ontario Pork, and the Saskatchewan Agricultural Development Fund.